01. How to use parameters in redirect url ? Redirect URL Example: http://www.yourdomain.com/testpage.html&parameter1=test1&parameter2=test2 In above redirect url we have two parameters (parameter1 and parameter2). Step 2: Go to line “$return_url=$this->getRequest()->getParam(‘return_url’);” and add below line of code after this line. Step 3: Change above redirect url with @ instead of & like below. Step 4: Now you can use step 3 url as redirect url. If you want to use other character rather than @ then please update it in step 2. 02. What is Discount Coupon Code Link Extension for Magento? Discount coupon code link that triggers automatic discount coupon code for shoppers/customers on the shopping cart page. It is great to use “Discount Coupon Code Link” in newsletter campaigns, emails, marketing blogs or posts, online/offline ads, social media posting or in any promotional tools. “Discount Coupon Code Link” will automatically apply coupon code when products are added to shopping cart. Eye-catching lightbox popup with pre-configured message when coupon code applies. Easy configuration for Miscellaneous scripts, Success message, lightbox popup and custom redirection URL settings. View report of “No. of Views” for particular coupon code link. Easy to use and very well documented. 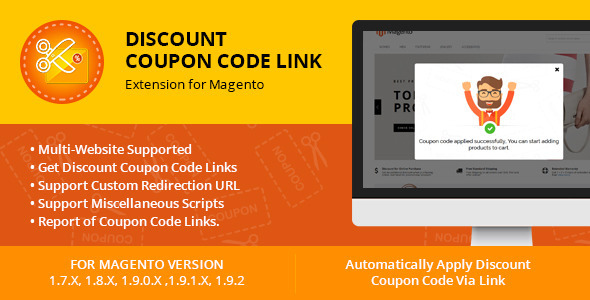 Discount Coupon Code Link Extension does not overwrite any Magento core files. Work with custom templates.